This ancient name is of Anglo-Saxon origin, and is one of the earliest topographical surnames still in existence. The name derives from the Old English pre 7th Century "ford", ford, a shallow place in a river of water where men and animals could wade across. The term was used as a topographic name for someone who lived near a ford. Topographical surnames were among the earliest created, since both natural and man-made features in the landscape provided easily recognisable distinguishing names in the small communities of the Middle Ages. In some cases the modern surname may be locational in origin, deriving from one of the many places named with the Old English "Ford", such as those in Herefordshire, Northumberland, Shropshire, Somerset, and Sussex. 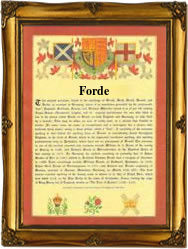 The modern surname can be found as Ford, Forde, Foord, Foard, Forth etc.. On March 2nd 1589 Izabell Forde and Henry Embertonn were married in St. Giles Cripplegate, London, Sir Ambrose Forde was knighted at Leixlip, County Kildare, by Sir George Cary, the Lord Deputy, on August 2nd 1604. The first recorded spelling of the family name is shown to be that of Bruman de la Forda, which was dated 1066, in the Book of Winton, Hampshire (included in the Domesday Book of 1086), during the reign of King William 1st, known as "William the Conqueror", 1066 - 1087. Surnames became necessary when governments introduced personal taxation. In England this was known as Poll Tax. Throughout the centuries, surnames in every country have continued to "develop" often leading to astonishing variants of the original spelling.